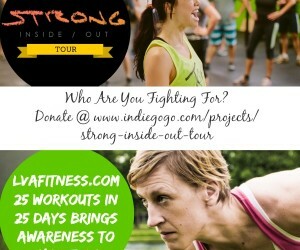 The 25 Workouts in 25 Days Summer Challenge is all about bringing awareness to Amy Clover’s Strong Inside Out Tour. For 25 days (while Amy’s campaign is going on) I’m doing my own 10-ish minute workouts in 25 Minneapolis outdoor locations. I invite you to join me. Pick an awesome outdoor location in Minneapolis (or the state you live in). Do 10 minutes of training; ie, running, rollerblading, squats, push ups, speed walking hills, dips, mountain climbers, burpees, or follow along with one of the workouts I’ve posted. 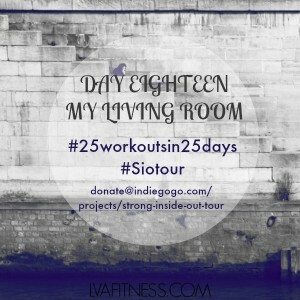 Post a pic of your workout spot on FB, Twitter, or Instagram with the following hashtags #siotour #25workoutsin25days. Commit to your challenge by donating to Amy’s campaign here. Every amount helps her get the funds needed to have a successful tour. If you can’t get a workout in every day, NO WORRIES! Post pics when you do a workout using the hashtags above and know that your donation is going to an amazing cause! I’ll be posting here on the blog as well as pics to my FB page, Twitter, & Instagram. Follow along to see my workout spots and spread the love. It’s raining. And it’s been raining. And then there’s more rain. I wanted to hit the outdoors since I worked out inside yesterday with Heidi, but the downpour led me to popping my T-25 video into the TV and busting out a workout with Shaun. Verdict after day 18: Even when it’s raining and the weather isn’t working for you, a workout is still possible. Pop in a vid and rock it out! You’ll feel better when you’re done. Great job Lisa! You look amazing and are an inspiration!! Thanks!